Theobroma Cacao, by Scott Stevenson. At first glance, I thought the blogger’s name might be “Theobroma Cacao,” but that’s just because I didn’t know that it’s the Latin name for the plant from which chocolate is made. Mmm, chocolate. 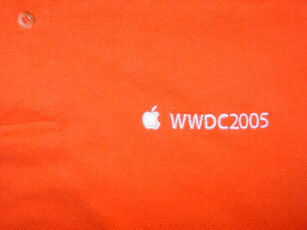 He has a bunch of posts about WWDC 2005, though, to be fair, no shirt pictures. Xcode Experiences, by Marshall Clow, his blog about moving from CodeWarrior to Xcode, since CodeWarrior will not be supporting the Universal Binary format required to run on Intel Macs. 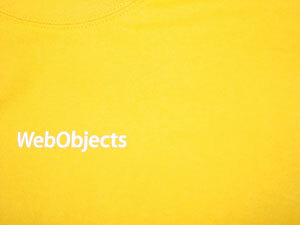 Marshall’s blog was the impetus for my last post about CodeWarrior and Xcode. Ridiculous Fish, by Peter Ammon, an AppKit developer. Buzz Andersen, also on my list, introduces Peter’s blog here. Though Buzz also seems to have changed his RSS feed URL sometime in the last 3 months, from http://www.scifihifi.com/?flav=rss to http://weblog.scifihifi.com/feed/, which caused my NetNewsWire feed of his blog to go dead. Bad Buzz! I’m a little late to the party, both getting there and telling the world about it, but I got my umbrella-topped pink drink (or membership card, depending on your metaphor) on June 21, a little over two weeks ago. There will be things I can’t talk about, but considering the silence round these parts, it’s not like that’s going to cut off a vital flow of information you’ve come to depend on! I’m hoping to be able to post more here, since, after all, it’s so well-named.